Non-medicinal ingredients: microcrystalline cellulose, sodium stearyl fumarate, silicon dioxide, dicalcium phosphate. Capsule: hypromellose, chlorophyll. 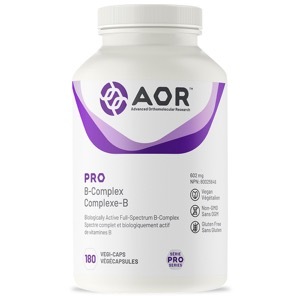 Pro B-Complex contains essential B vitamins that perform important roles in the body such as: promoting metabolic and nerve health, providing stress support, and more essential functions. B vitamin supplementation is useful for preventing vitamin B deficiencies associated with Type 2 diabetes, neurological disorders, anemia, depression, neuropathy, stress, and neural tube birth defects. B vitamin supplementation also has applications for reducing cellular glycation and promoting anti-aging, healthy homocysteine metabolism, hormonal balance, cellular energy production, and brain function. Pro B-Complex delivers the most biologically active and efficient forms of these vitamins in balanced doses, ensuring maximum benefits. Adult Dosage: Take 1 capsule one to three times daily with food. Cautions: Caution for use beyond 8 weeks. People with thiamine hypersensitivity should not take this product.